I have a few favorite authors in the Christian Romance category. I've talked about them before. 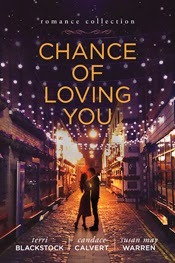 When I saw Chance of Loving You was written by three of my favorites, I simply had to jump in to review this book. I've read a couple of other anthology types of books in the past, where some authors "get together" and each write a portion of a book that ends up being separate, yet somehow connected, stories. I enjoyed all three stories immensely. One fabulous aspect is that they are each fairly short, so I didn't have to stay up until 4 a.m. finishing the book. I could stay up until 1:00 instead, and do the next story the next day! Terri Blackstock's story is quite different from what I normally read from her, so that was lots of fun. Candace Calvert's story mostly took place in a hospital, with the main characters being a hospital employee and a member of the police. That is typical of many of her stories, so I felt right at home with that one. Susan May Warren locates her story in Deep Haven, with the main characters all traveling there for the fishing contest. A few familiar faces from her other novels make appearances here, which is fun. If you've never read a Deep Haven novel, though, you don't miss out on anything in this one. This was a fun book to read!